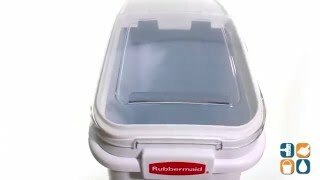 Provides mobile bulk storage of ingredients with this lightweight, easy to transport slant front Rubbermaid ingredient bin. Mobility increased with 3" extra-wide casters, two swivel. Seamless construction and rounded corners for easy cleaning. Two-piece lid slides back or flips up for easy access. White with clear polycarbonate lid for quick identification of contents. Scoop hook keeps scoop in the bin, but out of ingredient, preventing cross-contamination. This large food storage container includes a 32-oz. 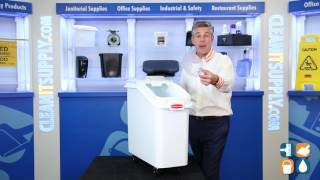 Bouncer® Scoop for the ultimate in convenience. Made of FDA Compliant materials. USDA Meat & Poultry Equipment Group Listed Strong structural web base with smooth molded three-layer thick walls. Dimensions: 29-1/4"L x 13-1/8"W x 28"H.